This episode is a companion to Episode 084, where we go on an interactive tour of Lost Spirits Distillery in Los Angeles, CA with co-founder Bryan Davis. Bryan’s thoughts on the impact his accelerated approach to barrel aging has had on the spirits industry at large. How Lost Spirits uses innovation as a way to contribute meaningfully to the global conversation that all distillers and consumers are currently engaged in. Thoughts on building the perfect distillery, and why the goal doesn’t need to be selling more and more cases of booze. The story of how Bryan learned to make his first (and last) cocktail from legendary New York Bartender Sasha Petrasky. Why the end of the 19th century was the peak of American and English culture, in terms of innovation. This episode’s featured cocktail is the Jet Pilot, which is a complex Tiki drink invented in 1958 at the Beverly Hills Luau Restaurant. 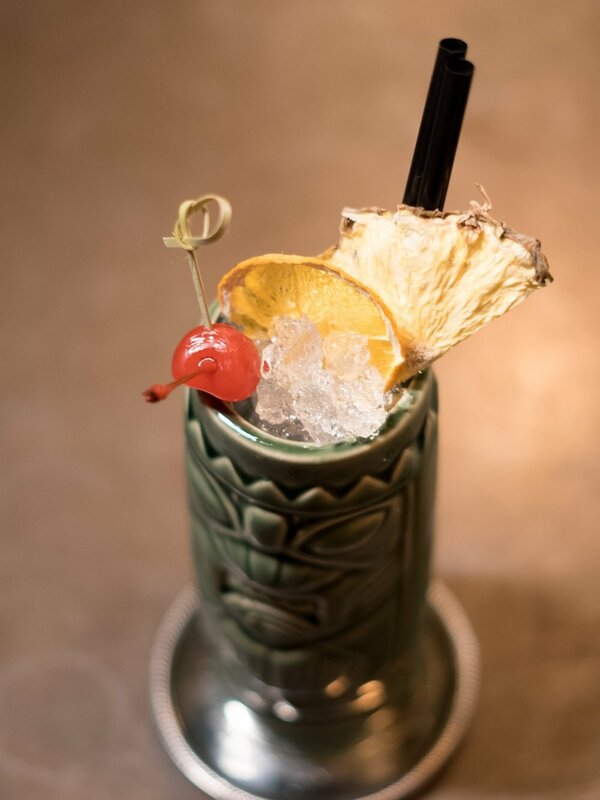 This is a riff on an earlier cocktail called the “Test Pilot,” which was developed by Don the Beachcomber himself, but the Jet Pilot seems to have made more of a name for itself in the Tiki canon. Now, technically, this is a blender drink, where you combine all ingredients in a blender with ice and blitz em up for no longer than 5 seconds. Essentially, the goal is to crush the ice up without turning it into a slushy. But this effect could very easily be replicated by shaking this drink for about 20 seconds with a couple nice, large 2” ice cubes and then straining into a rocks glass over some crushed or pebble ice. I feel like that method might be slightly more convenient than the blender route. Also, this goes against pretty much every rule in the tiki rulebook, and we’re sure Don the Beachcomber and Trader Vic are simultaneously rolling in their graves as we utter this heresy, but if you don’t have 3 different bottles of rum laying around, you can probably get away with using your favorite dark rum. For the month of February (2019) The Bitter-Sweet Box is back! This is an excellent gift to give to your sweetheart, or your office mates, or your mailman this Valentine’s day. This is a nifty little gift box that contains 30ml bottles of our Embitterment orange and chocolate bitters, as well as a couple chocolate bar minis courtesy of our friends over at Chocotenango. Now check out what we’re doing to really sweeten this deal - in the past, we had two mini dark chocolate bars - one cacao nib, and one sea salt. This year, we’re DOUBLING the chocolate - so you get four gourmet dark chocolate bars and two bottles of bitters. Normally, this retails for $15, but if you enter the coupon code “BEMINE” (all one word) at checkout, you’ll get $3 off your Bitter-Sweet Box purchase. This code is only gonna stick around for the Month of February, so be sure to head on over the modernbarcart.com and grab one of these awesome gift boxes before they’re gone. Bryan mentions a lot of cool stuff in this episode, so here’s a list of quick links that will send you off to investigate all the neat resources we speak about in the episode. For inspiration, late 19th century English/American literature. For technical research, PubMed.